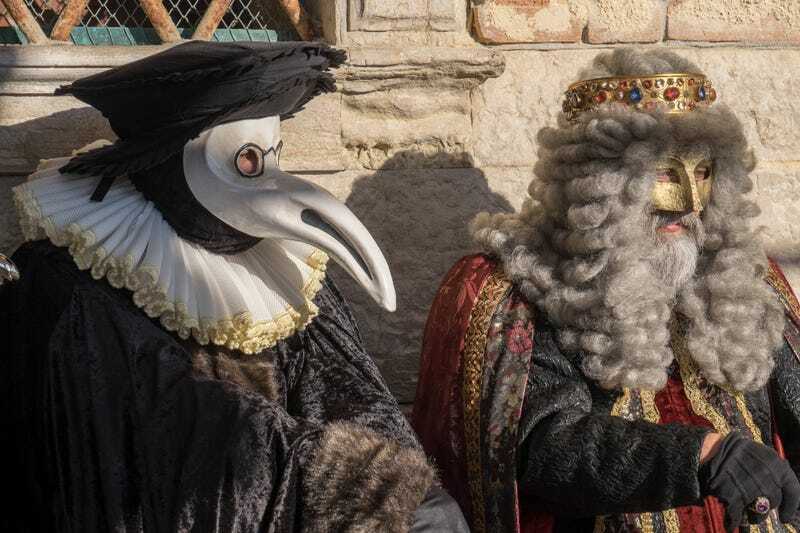 One of the most distinctive masks worn during the Carnival of Venice is “Il Medico della Peste,” or “The Plague Doctor.” But the distinctive bone-white mask and black clothing was actually the 17th century equivalent of a biocontainment suit. Albeit one based on very shaky science. As this 1619 is also the first description of this suit, de Lorme is also credited with inventing it. Let’s go through it from head to toe. First up is the wide-brimmed leather hat. As we’ve discussed before, no job in the 17th century really meant anything unless it had an official hat. Lawyers had wigs, the clergy had a whole mess of headgear, doctors had these. Because you know how disease hates hats. The birdlike mask—which may predate the outfit by several centuries—was a gas mask. Sort of. de Lorme’s description says the beak should be “filled with perfume” and herbs stuffed into it. That’s because of the miasma theory of disease. In a lot of the masks you see today, there are black circles around the eyeholes, connected by a curved black line. That’s a representation of the spectacles the actual plague doctors had on their masks, which went a long way to keeping the evil miasma away from the doctors. The long black coat was tucked into the mask. Along with gloves and boots, the leather ensemble was a covering designed to protect the doctors’ skin from contact with the disease. Despite getting the foul air bit completely wrong, it’s not a completely ineffective way to protect against disease. Everything was even waxed so that liquids couldn’t permeate anything. It’s not as a doctor plying noble trade that has given the costume its staying power. Plague equaled death, and when you have black garbed doctors roaming around with giant protruding mask noses and no eyes, you’re going to start associating them with death, too. The mask and costume became associated with the commedia dell’arte character Il Medico della Peste. And the white version of the mask was adopted in Venice and is now a frequent Carnival sight.